We schedule a 2.5 hour appointment with 30 minutes for medical numbing cream. 15 - 20 minutes for brow design & measurements. 60 - 90 minutes of treatment time. We re-apply numbing cream throughout the treatment. Are there any restrictions on when I should get microblading treatment? There are certain medical contraindications for microblading, we will go over these in your consultation. Microblading should be done at least 14 days AFTER a Botox, Dysport or Xeomin treatment. Also wait at least 14 days after a microblading treatment to get a treatment of Botox, Dysport or Xeomin. Please give yourself 10 - 14 days to heal before needing to attend an event or sun/beach vacation. Can I get other facial treatments? We recommend waiting to get any kind of facial, chemical peel or laser treatment on the face for 14 days after microblading and nothing but a regular facial for 14 days prior to microblading. How long does it take for brows to heal? Initial healing takes 5 - 10 days with the balm that we give to you. After that brows will look 'cloudy' and light, as there is a layer of skin over the fresh strokes. This skin exfoliates off over the next 3 weeks. They are fully healed at week 5 or 6. The more diligent you are with the after care instructions, the better your outcome will be. We send you home with detailed after care instructions. Touch Ups - EVERY client needs at least one touch up, some will need two touch ups, after the initial treatment. Without the touch up you will not get maximum pigment retention. Touch ups are done 8 weeks after the initial treatment and the cost is $50. Note: We do not offer touch up pricing on other artists work. We will give you a quote for this on a case by case basis. Is this treatment for all skin types? Oily skin IS a contraindication for microblading. If you have oily skin we determine if you are a good candidate for it on a case by case basis. The hair strokes don't retain well on oily skin and they can also blur once healed. Once the desired brow is achieved in usually 2, or sometimes 3, sittings total - your brows will stay pigmented for usually 18 months to 2 years before needing a color boost. This timeframe is an estimate and it may vary. Some contributing factors for pigment retention are: aftercare compliance, sun exposure, skin type, skins healing ability, skin products used, facial treatments, laser treatments etc. We use a fully synthetic pigment. There is no iron oxide in our pigment which means that the color stays true and does not fade to an undesired color. The pigment is semi permanent and is designed to be built up over multiple treatments and it is also designed to fade and lighten over time, when we refresh it with a color boost treatment at 12-18 months. Can I still get a microblading treatment if I tattooed my brows in the past? If you have an existing old tattoo with permanent ink we usually perform 1 or 2 removal treatments first with a laser. These treatments are spaced 8 weeks apart and are $25 each and need to be completed before we microblade your brows. This is a case by case basis. Sometimes we can cover up the existing tattoo and sometimes we need to remove or lighten the old tattoo with laser treatment(s) first. Do I need a consultation before I start a microblading treatment? 15 minute microblading consults may be scheduled online and are free of charge. Consultations can also be done via texting if you can send good, clear pictures of your brows with no make up on them to (702) 551-2833. Browz is proud to use, and is an authorized retailer of Glo Minerals and Glo Therapeutics. 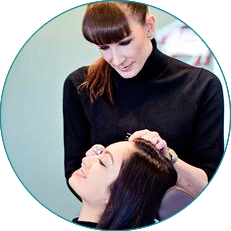 "I have had a passion for eyebrows since my first day of aesthetics training, 15 years ago. I quickly realized that I could see the potential in every eyebrow that I came across. To my delight, I also realized that I have a natural talent for shaping eyebrows.The eyebrows are such a seemingly small detail, yet a well shaped eyebrow has a dramatic impact on our appearance. It makes us look well groomed and it opens up the eyes. After all, the first place that people look when they talk to us, is our eyes. I look forward to meeting you and to helping you achieve your fullest eyebrow potential!"